I recently bought this bear at an auction because I fell in love with him. 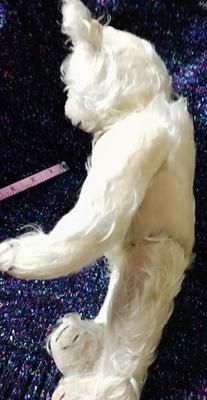 He is really quite bald, he still has long mohair fur on his right side arm and both legs, the mohair fur is very pale yellow in the areas that have seen the least light and touch, very fine and silky in texture. He has long pink felt paw pads on his arms (2" long) and legs (3" long) and 4 "claws" in black stitches on each pad, starting quite high on the fur side and extending only a small amount on to the pad. The hand stitching to close him after stuffing is on his back under his hump, The hand stitching is about 3" long and very sturdy. I don't know what the name of the stitch, it is, it seems very familiar, possibly similar to the old way of stitching up sacks. seam) with longish narrow feet. 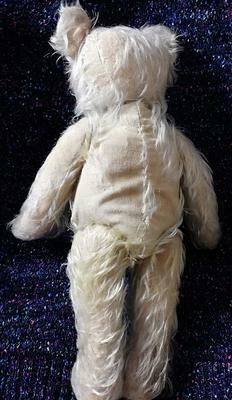 His body has a joining seam on the front and back and is formed from 2 pieces of cloth. The head is formed of three pieces of cloth. The back of his head has two seams that form a V shape from the middle of the nape of the neck to the point where the ears attach. On each side a piece of material wraps around to join at the front where the downward stitch goes from the nose and then makes the mouth. The ears themselves are the shape of bear ears (!) and formed of two pieces of material stitched together. 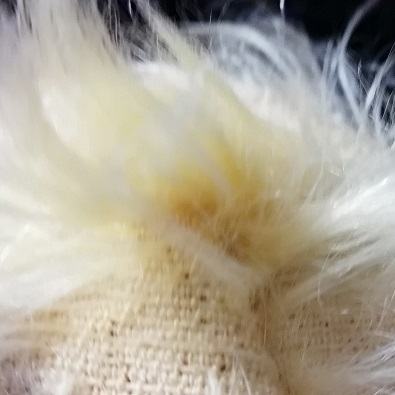 The piece of material that leads from the V at the back of the neck is cut from the ears to to form a strip of material that defines the top of his nose, the eyes are attached directly over this seam. 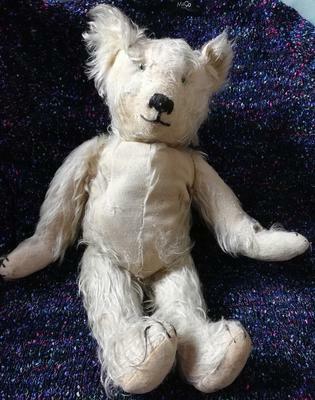 The seam ends in the nose. His nose is sewn on in black thread using vertical stitches, in a down pointing shield shape with a small mouth underneath. He has small round green glass eyes with a metal loop on the reverse to hold them in place. He appears to be stuffed with wood wool (excelsior), body and head. He is jointed, his arms, legs and head all move. He is 15” from top of head to base of feet. He has a squeeze box in his belly that produces a tune, one squeeze at a time. I did initially think Bing but I don't think so.